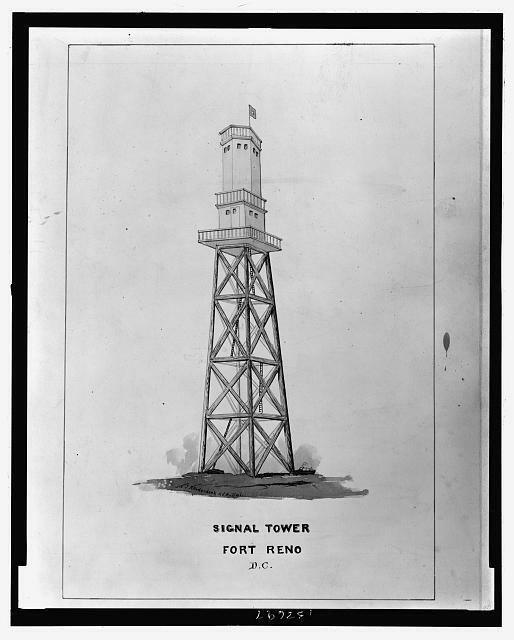 This image shows the tower at Fort Reno, one of the ring of instillations surrounding Washington City and just above Red Hill, the US Army Signal Corps' initial and most active camp-of-instruction during the war. It was from this point during Confederate General Jubal Early's attack on the defenses of Washington DC that messages were received from Fort Stevens (Where President Lincoln was upon the field) by flag and then transmitted to the War Department by wire telegraphy. Other aerial signal traffic may have travelled from the Soldier's Home through the Provost's Office station to the Winder Building but I haven't as yet established that this was ever the case. As you can see... Fort Reno signal station is not your typical perch.